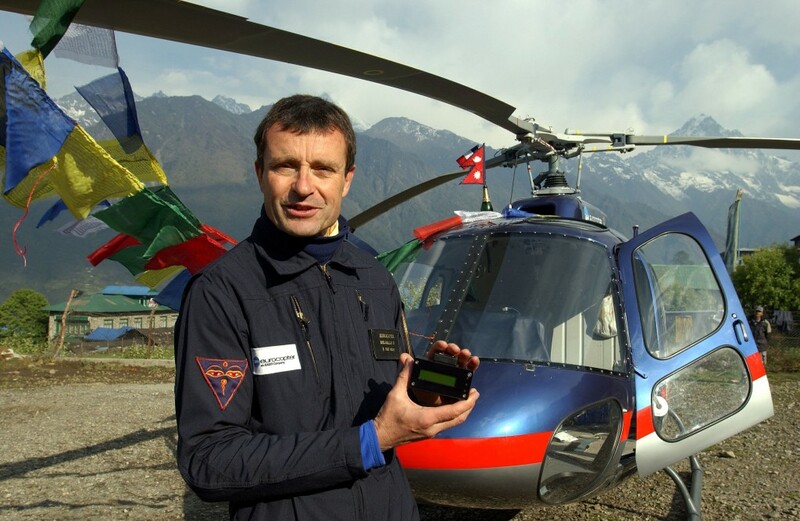 14 May 2005: Test pilot Didier Delsalle landed a Eurocopter AS 350 B3 Ecureuil, c/n 3934, registration F-WQEX, at the summit of Mount Everest, the highest point on Earth, at 8,848 meters (29,029 feet). 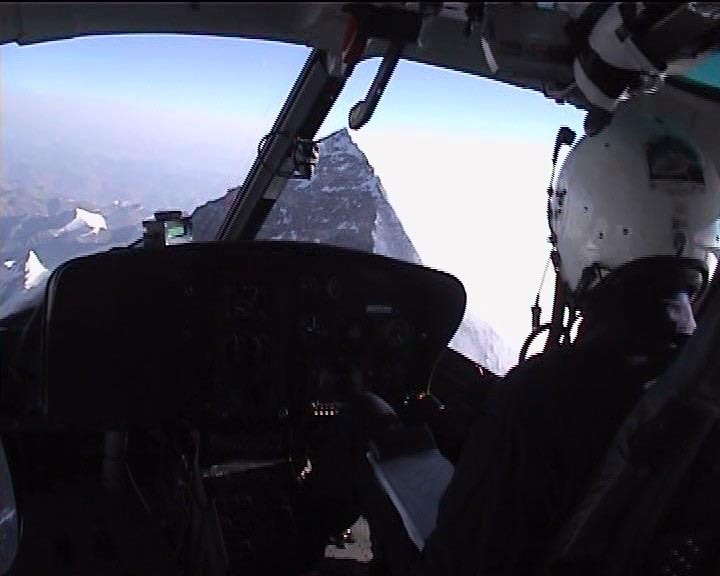 Delsalle also rescued two Japanese climbers at 16,000 feet (4,877 meters). Didier Delsalle was born 6 May 1957, at Aix-en-Provence, France. He joined the Armée de l’Air (French Air Force) in 1979, and was trained as fighter pilot. In 1981 he transitioned to helicopters and was assigned to search-and-rescue operations. After twelve years military service, Delsalle became an instructor at École du personnel navigant d’essais et de réception, the French test pilot school at Istres, France. 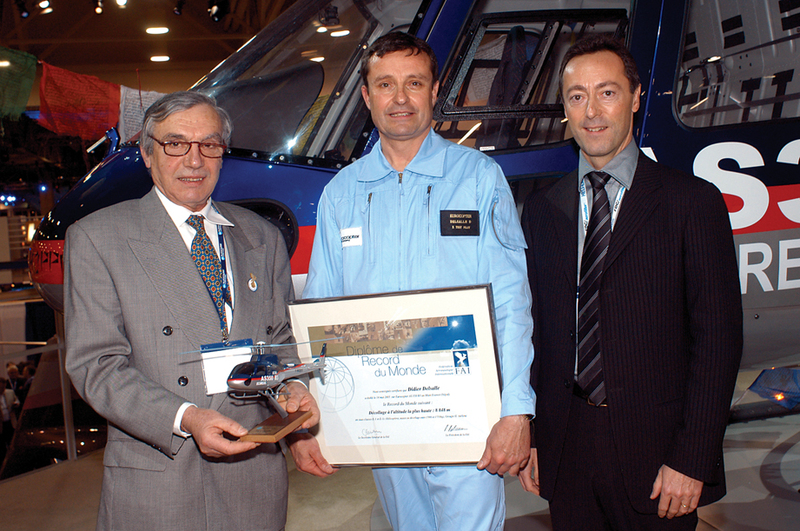 He then became the chief test pilot for light helicopters for Eurocopter, and later for the NH90 medium helicopter. Delsalle holds seven FAI world records, five of which remain current. The Eurocopter AS 350 Écureuil is a 6–7 place, single-engine light helicopter, operated by a crew of one or two pilots. (It is known as the A-Star in the United States.) Introduced by Aérospatiale in 1975, it remains in production today and is one of the most popular civil helicopters. The manufacturer is now known as Airbus Helicopters. 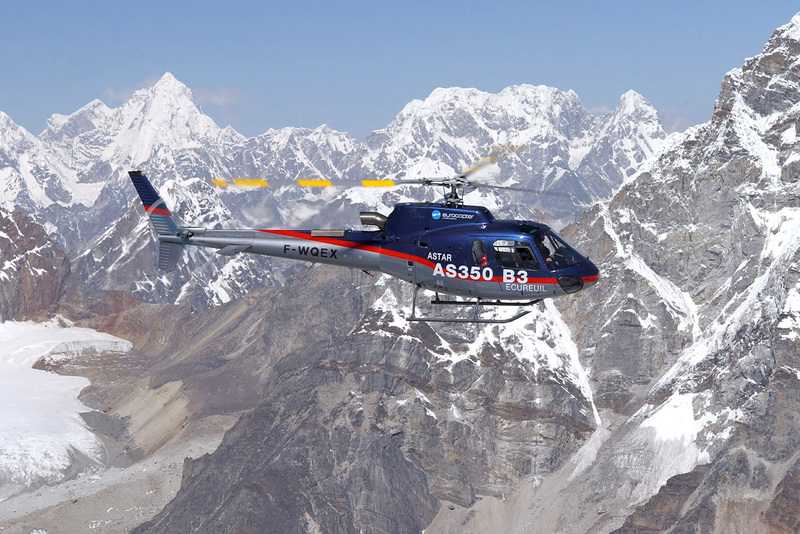 The AS 350 B3 is a high-performance variant, widely used in law enforcement. The overall length with rotors turning is 12.94 meters (42 feet, 5.4 inches). 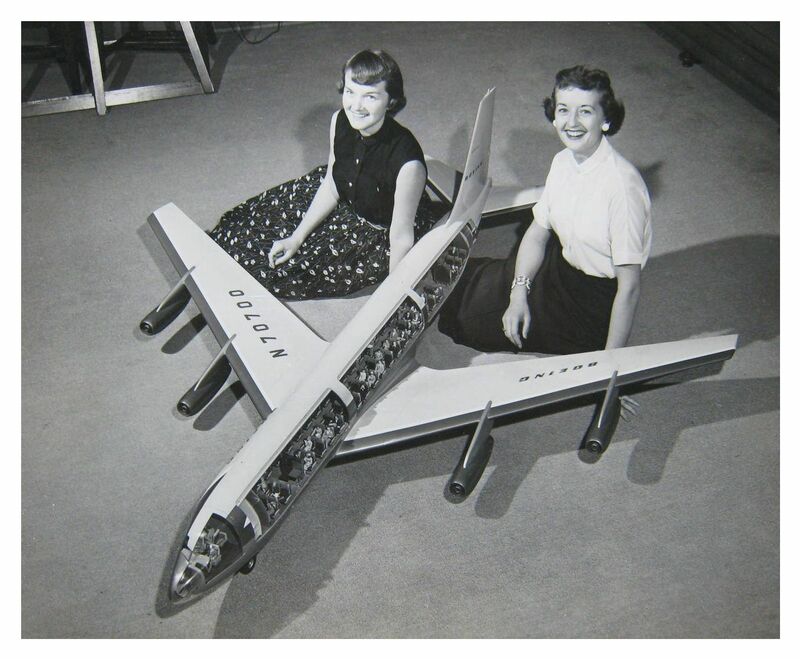 The fuselage is 10.93 meters (35 feet, 10.3 inches) long and the cabin is 1.87 meters (6 feet, 1.6 inches) wide. The helicopter’s overall height is 3.14 meters (10 feet, 3.6 inches). 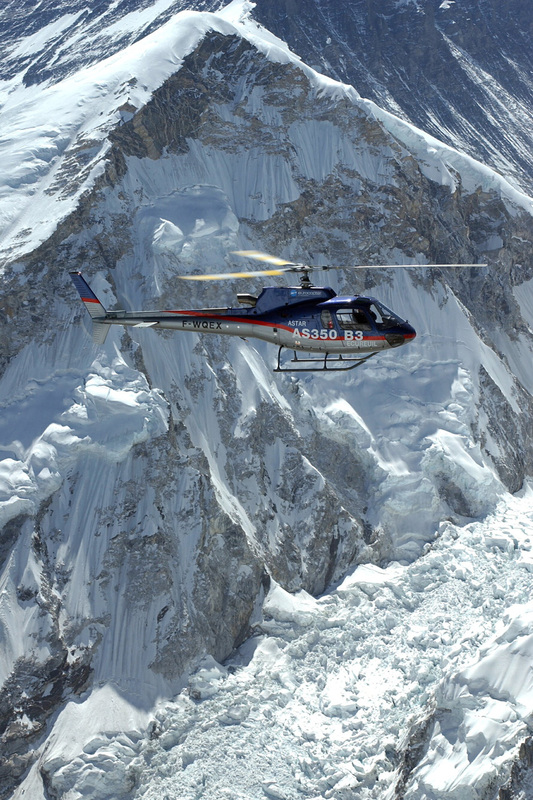 The AS 350 B3 has an empty weight of 2,588 pounds (1,174 kilograms), depending on installed equipment, and maximum gross weight of 2,250 kilograms (4,961 pounds). 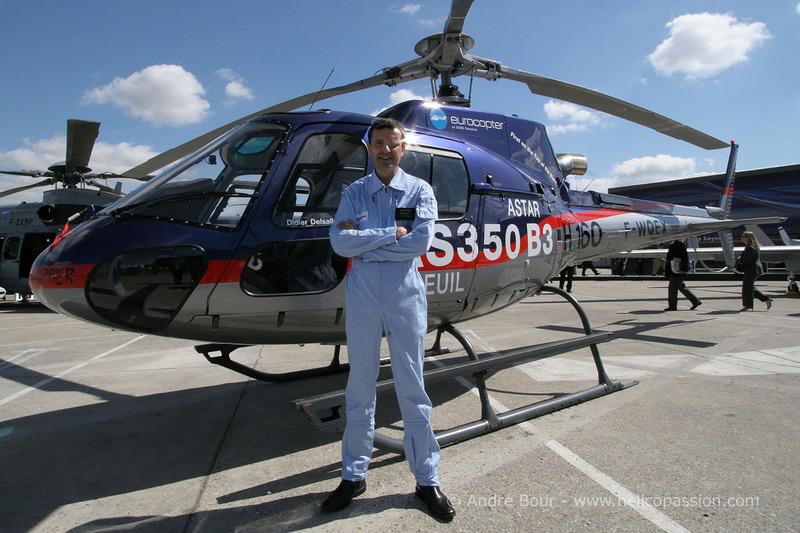 The AS 350 B3 variant is powered by a single Turboméca Arriel 2B turboshaft engine. The Arriel 2B is a free turbine turboshaft engine which uses an electronic engine control system (EECU). The engine has a two-stage compressor section (single-stage low-pressure axial flow, single-stage high-pressure centrifugal flow); an annular combustion chamber; and two-stage turbine section (single-stage gas generator and single-stage power turbine). The compressor section turns 52,110 r.p.m. at 100% N1; The power turbine, N2, turns 39,095 r.p.m. at 100%. A gear reduction unit reduces the engine’s output shaft speed to 5,990 r.p.m. The Arriel 2B produces 847 shaft horsepower, but is de-rated to the helicopter’s main transmission limit. Installed, the Arriel 2B is rated at 536 horsepower for cruise; 700 horsepower, Maximum Continuous Power; and 733 horsepower for take off (5 minute limit). The Arriel 2B is 118.0 centimeters (3 feet, 10.46 inches) long, 50.0 cm (1 foot, 6.69 inches) wide, 62.0 cm (2 feet, 0.41 inches) high. It weighs 134 kilograms (295.4 pounds), dry. The Arriel series engines are now produced by Safran Helicopter Engines. The AS 350 B3 has a cruise speed of 132 knots (152 miles per hour/245 kilometers per hour) and maximum speed of 155 knots (178 miles per hour/287 kilometers per hour). It carries over four hours of fuel and has a maximum range of 357 nautical miles (411 statute miles/662 kilometers). The maximum allowable altitude is 7,010 meters (23,000 feet). 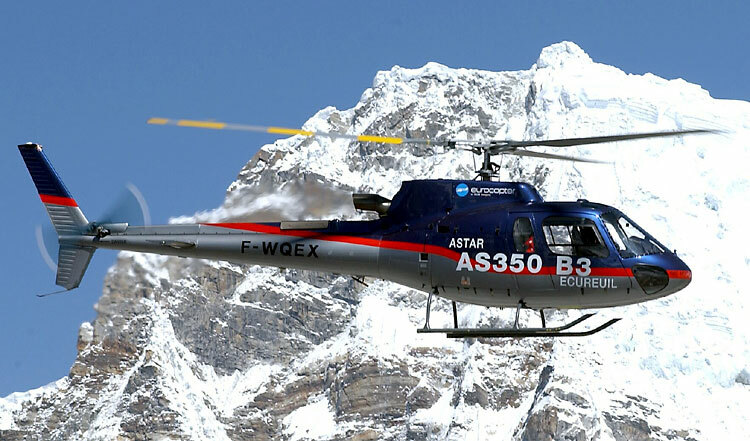 AS 350 B3 c/n 3934 was originally registered F-WWPN, then F-WQEX, and was later registered as F-HMGM, in service with Hélimountains, Bourg-Saint-Maurice, France. As of 2014, F-WQEX is on display at the Musée de l’Aviation, Saint-Victoret, Provence-Alpes-Côte d’Azur, France. ¹ FAI Record File Number 11596: Highest take-off (Subclass E-1); FAI Record File Number 11596: Highest take-off (Subclass E-1c). 8,848 meters (29,029 feet). ² FAI Record File Number 11594: Highest take-off (Subclass E-1); FAI Record File Number 11595: Highest take-off (Subclass E-1c). 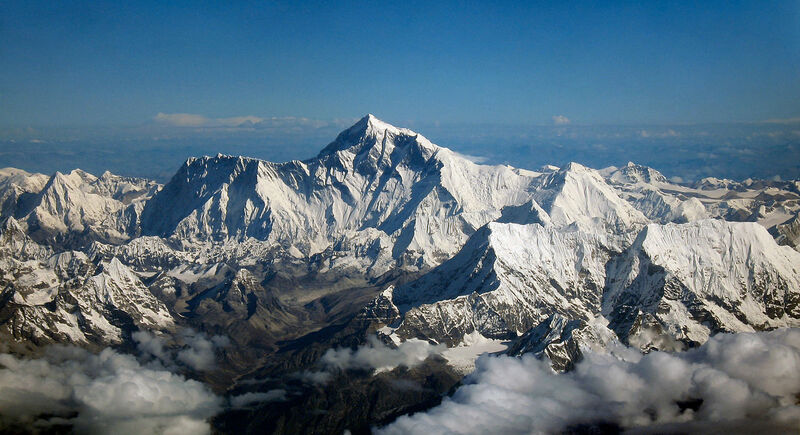 7,927 meters (26,007 feet). ³ FAI Record File Number 11323: 3,000 meters (9,843 feet), 2:21; FAI Record File Number 11325: 6,000 meters (19,685 feet), 5:06; and FAI Record File Number 11326: 9,000 meters (29,528 feet), 9:26. 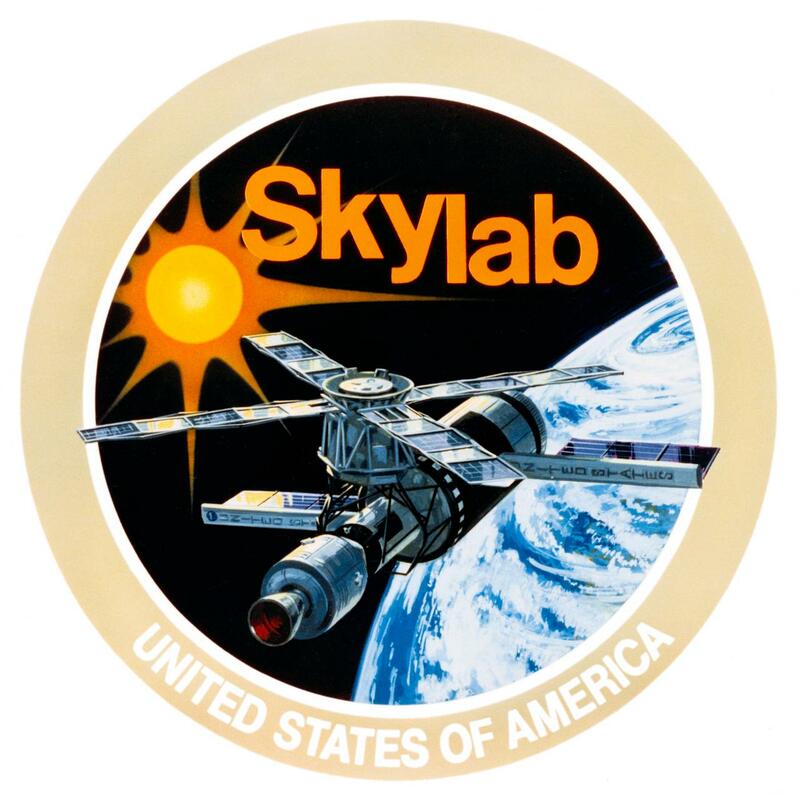 14 May 1973: At 12:30:00 p.m. Eastern Standard Time, America’s first orbital space station, Skylab, was launched by a Saturn V Launch Vehicle, SA-513, from Launch Complex 39A at the Kennedy Space Center, Cape Canaveral, Florida. First motion was detected at T + 000:00:00.22. After first stage separation, the S-IC/S-II interstage connector failed to separate from the second stage. because of this, orbital insertion occurred at T + 000:09:59.0; 0.64 seconds later than planned, and 0.6 meters per second faster than predicted. The S-II stage followed the Skylab into Earth orbit. Skylab’s orbit was almost perfectly circular, with an apogee of 234.2 nautical miles (433.7 kilometers), and perigee of 233.0 nautical miles (431.5 kilometers). The orbital period was 93.23 minutes, with a velocity of 17,111 miles per hour (27,537 kilometers per hour). Skylab was unmanned at launch. Three 3-man crews were carried to the station aboard Apollo command/service modules launched by the smaller Saturn IB rocket. Skylab’s mission was to demonstrate that humans could live and work in orbit for extended periods of time, and that they could also perform useful work and research. The first crew had to make repairs in orbit to extend a damaged solar array and to use a spare solar panel as a shade to prevent sunlight from overheating the station. This was the first orbital repair mission. Astronauts occupied Skylab for 171 days, 13 hours and conducted over 300 scientific projects. The Skylab was built from an empty Saturn V third stage, S-IVB number 213, modified by McDonnell Douglas. 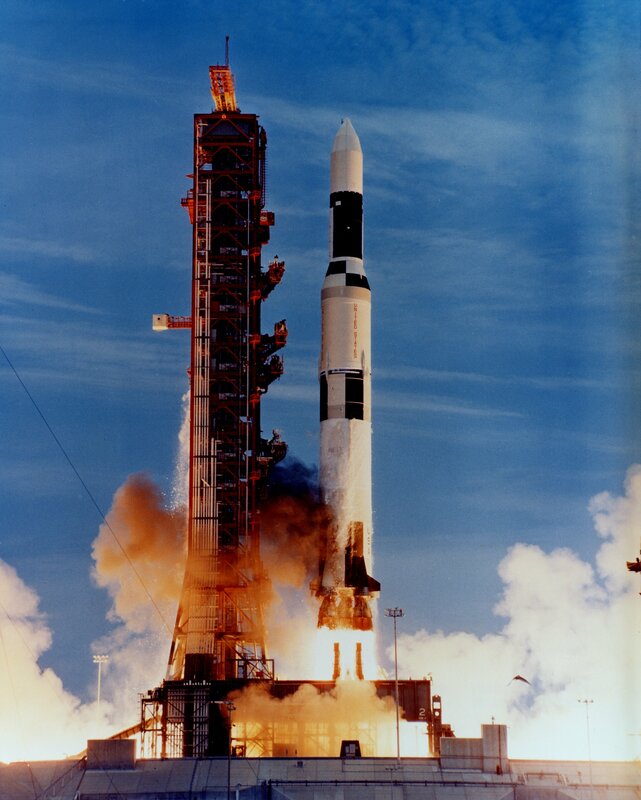 The launch vehicle consisted of the first two stages of a Saturn V rocket, an S-IC first stage and an S-II second stage. The total vehicle weight at engine ignition was 6,297,336 pounds (2,856,424 kilograms). Post-launch analysis determined that the five Rocketdyne F-1 engines of SA-513’s S-IC first stage generated 7,551,000 pounds of thrust (33,588.52 kilonewtons) at Sea Level. The first stage was designated S-IC. It was designed to lift the entire rocket to an altitude of 220,000 feet (67,056 meters) and accelerate to a speed of more than 5,100 miles per hour (8,200 kilometers per hour). The S-IC stage was built by Boeing at the Michoud Assembly Facility, New Orleans, Louisiana. It was 138 feet (42.062 meters) tall and 33 feet (10.058 meters) in diameter. Its empty weight was 290,000 pounds (131,542 kilograms). Fully fueled with 203,400 gallons (770,000 liters) of RP-1 and 318,065 gallons (1,204,000 liters) of liquid oxygen, the stage weighed 5,100,000 pounds (2,131,322 kilograms). The S-IC was propelled by five Rocketdyne F-1 engines, producing 1,522,000 pounds of thrust, each, for a total of 7,610,000 pounds of thrust at Sea Level. These engines were ignited seven seconds prior to lift off and the outer four burned for 168 seconds. The center engine was shut down after 142 seconds to reduce the rate of acceleration. The F-1 engines were built by the Rocketdyne Division of North American Aviation, Inc., at Canoga Park, California. The S-II second stage was built by North American Aviation at Seal Beach, California. It was 81 feet, 7 inches (24.87 meters) tall and had the same diameter as the first stage. 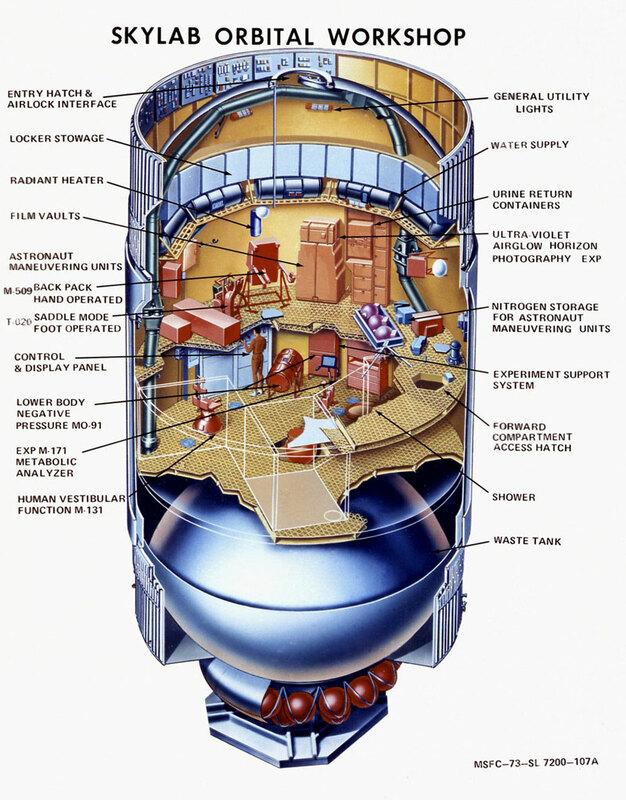 The second stage weighed 80,000 pounds (36,000 kilograms) empty and 1,060,000 pounds loaded. The propellant for the S-II was liquid hydrogen and liquid oxygen. The stage was powered by five Rocketdyne J-2 engines, also built at Canoga Park. Each engine produced 232,250 pounds of thrust, and combined, 1,161,250 pounds of thrust. 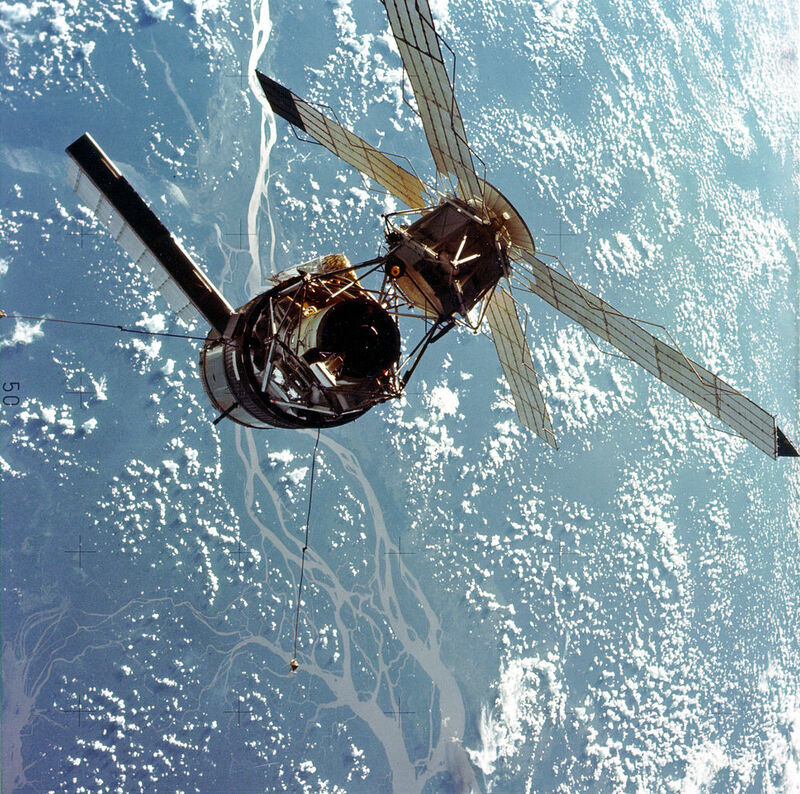 The unmanned space station’s orbit decayed and it reentered on 11 July 1979. It broke up and parts landed in the Indian Ocean and near Perth, Australia. 14 May 1954: The Boeing Model 367-80 prototype, N70700, was rolled out at the Boeing plant at Renton Field, south of Seattle, Washington. Boeing’s founder, William Edward Boeing (1881–1956) was present. The prototype made its first flight 15 July 1954 with Boeing test pilots Alvin M. “Tex” Johnston and Richard L. “Dix” Loesch. It is painted yellow and brown. Boeing had risked $16,000,000 in a private venture to build the Dash 80 in order to demonstrate its capabilities to potential civilian and military customers, while rivals Douglas and Lockheed were marketing their own un-built jet airliners. Put into production as the U.S. Air Force KC-135A Stratotanker air refueling tanker and C-135 Stratolifter transport, a civil variant was also produced as the Boeing 707 Stratoliner, the first successful jet airliner. Though they look very similar, the 707 is structurally different than the KC-135 and has a wider fuselage. 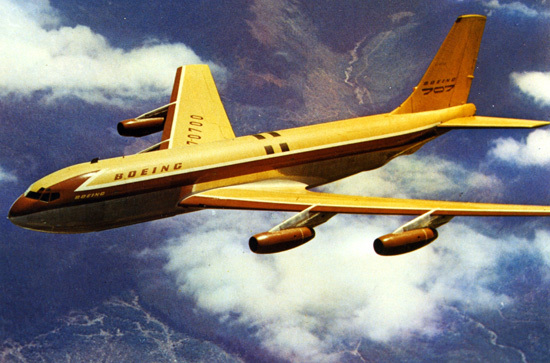 The prototype Boeing Model 367-80 was operated by a pilot, co-pilot and flight engineer. The airplane’s wing was mounted low on the fuselage and the engine nacelles were mounted on pylons under the wing, as they were on Boeing’s B-47 Stratojet and B-52 Stratofortress. The wings and tail surfaces were swept to 35° at 25% chord, and had 7° dihedral. The Dash 80 was 127 feet 10 inches (38.964 meters) long with a wingspan of 129 feet, 8 inches (39.522 meters) and overall height of 38 feet (11.582 meters). The tail span is 39 feet, 8 inches (12.090 meters). The empty weight of the 367-80 was 75,630 pounds (34,505 kilograms) and the gross weight, 190,000 pounds (86,183 kilograms). N70700 was powered by four Pratt & Whitney Turbo Wasp JT3C engines. This engine is a civil variant of the military J57 series. It is a two-spool, axial-flow turbojet engine with a 16-stage compressor and 2-stage turbine. The JT3C-6 (used in the first production 707s) was rated at 11,200 pounds of thrust (49.82 kilonewtons), and 13,500 pounds (60.05 kilonewtons) with water/methanol injection). The JT3C is 11 feet, 6.6 inches (3.520 meters) long, 3 feet, 2.9 inches (0.988 meters) in diameter, and weighs 4,235 pounds (1,921 kilograms). These gave the 367-80 a cruise speed of 550 miles per hour (885 kilometers per hour) and a maximum speed of 0.84 Mach (582 miles per hour, 937 kilometers per hour) at 25,000 feet (7,620 meters). The service ceiling was 43,000 feet (13,106 meters). Its range was 3,530 miles (5,681 kilometers). Boeing continued to use the 367–80 for testing, finally retiring it 22 January 1970. At that time, its logbook showed 2,346 hours, 46 minutes of flight time (TTAF). It was flown to Davis-Monthan Air Force Base, Tucson, Arizona, and placed in storage. In 1990, Boeing returned it to flyable condition and flew it back it to Renton where a total restoration was completed. Many of those who had worked on the Dash 80, including Tex Johnston, were aboard. 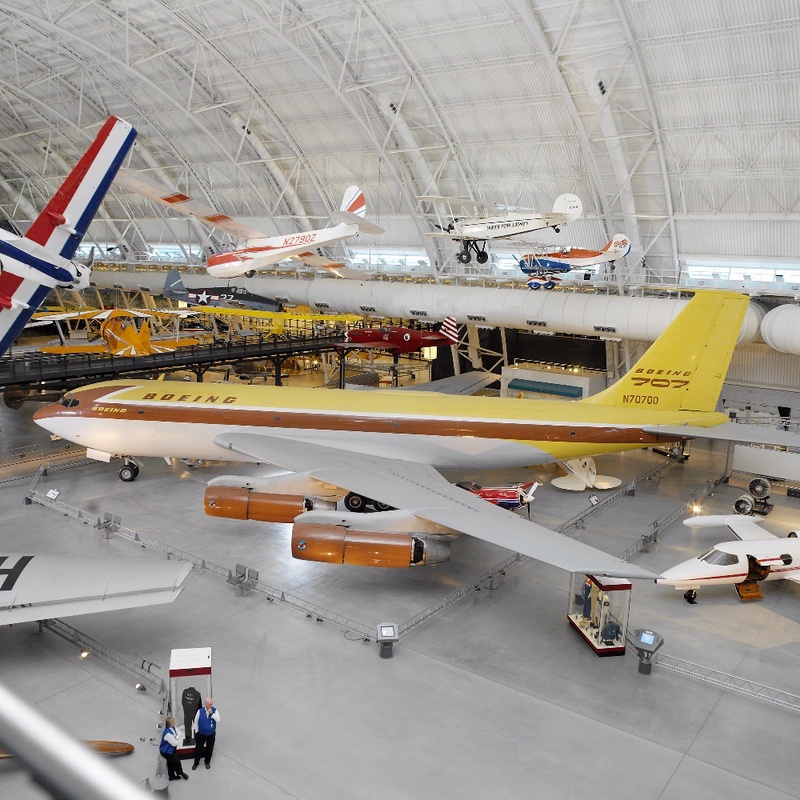 The pioneering airplane was presented to the Smithsonian Institution and is on display at the National Air and Space Museum, Steven V. Udvar-Hazy Center. 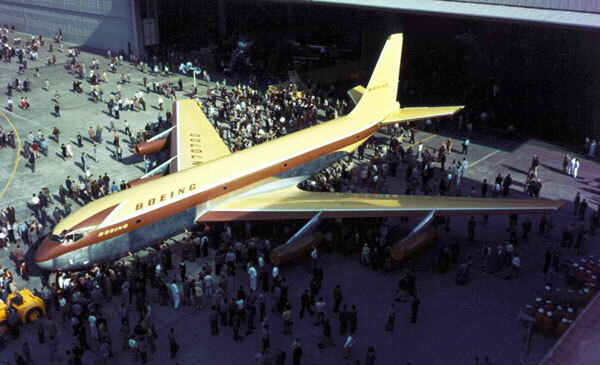 The Boeing 367-80 was designated an International Historic Mechanical Engineering Landmark by the American Society of Mechanical Engineers. 820 of the C-135 series and 1,010 Model 707 aircraft were built from 1957–1979. 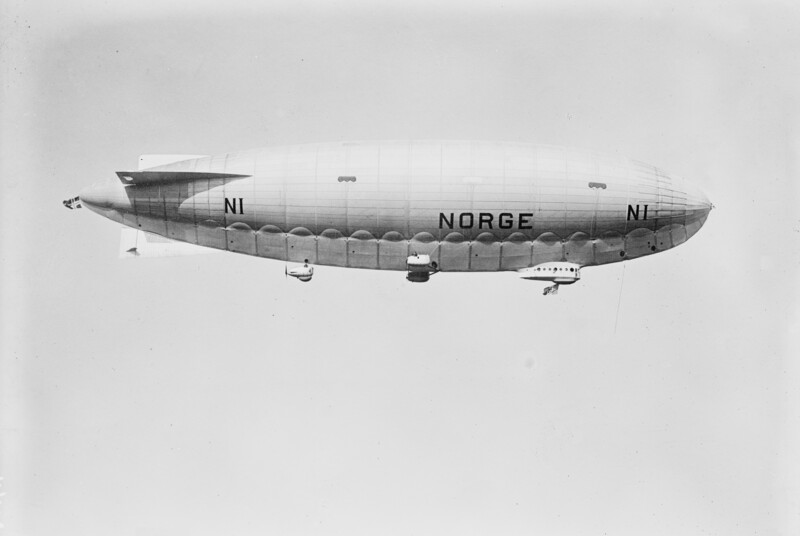 Airship Norge departing Ny-Ålesund, Svalbard, Norway, 11 May 1926. 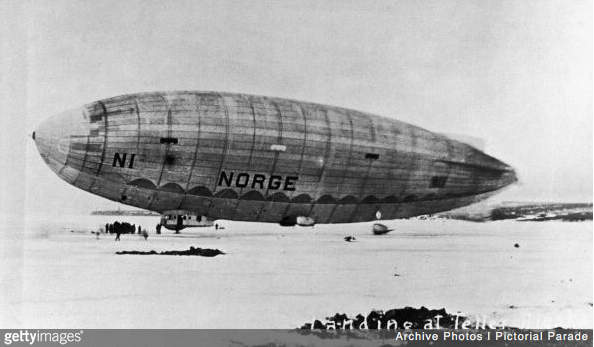 11–14 May 1926: The famed Norwegian arctic explorer, Roald Engelbregt Gravning Amundsen, departed Ny-Ålesund, Svalbard, Norway, aboard the semi-rigid airship Norge. The airship had been designed by Colonel Umberto Nobile and built at the Italian State Airship Factory at Rome, originally named simply N1. 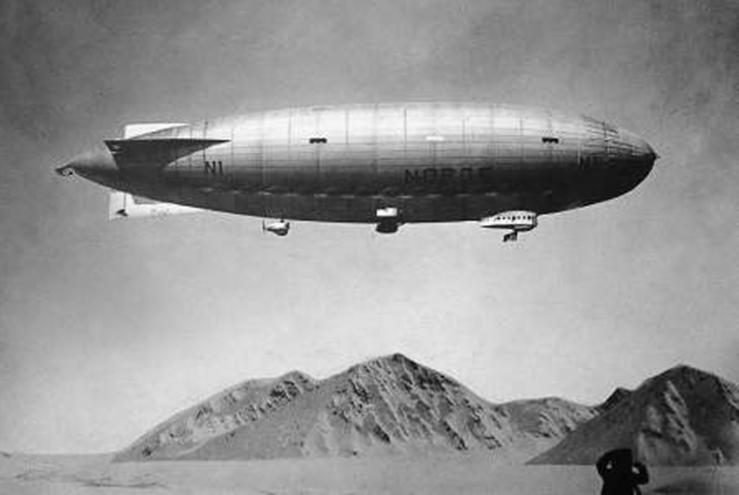 In discussions between Amundsen and Nobile, it was determined that N1 was not suitable for an arctic flight, but Amundsen didn’t want to wait for a new lighter-than-air craft to be be built, so Nobile modified it. 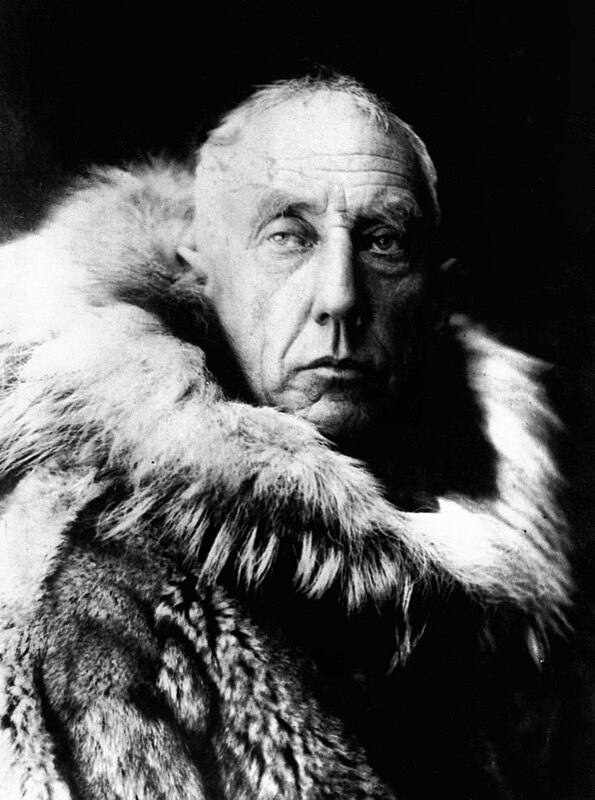 Amundsen purchased N1 and re-named it Norge. According to an article in the 20 March 1924 edition of Flight, the airship was 106 meters (347 feet, 8 inches) in length, 26 meters (85 feet, 3 inches) in height, with a maximum diameter of 19.5 meters (64 feet). Buoyancy was provided by 19,000 cubic meters (670,700 cubic feet) of hydrogen. The airship had a useful load of 10,850 kilograms (10.5 tons). Its maximum speed was 100 kilometers per hour (62 miles per hour). Norge was propelled by three water-cooled, normally-aspirated 23.093 liter (1,409.225 cubic inch) Maybach-Motorenbau GmbH Mb.IV inline six-cylinder overhead valve (OHV) engines with four valves per cylinder and a compression ratio of 6.88:1. The engine was able to produce 240 pferdstarke (236.7 horsepower) at 1,400 r.p.m. The engines were placed in gondolas suspended by cables under the hull, and drove propellers through a clutch. A reverse gear was available. With a 16-man expedition and Umberto Nobile as pilot, Amundsen departed Ny-Ålesund at 9:55 a.m., enroute to Nome, Alaska, via the North Pole. Norge arrived at the Pole at 1:25 a.m. GMT, 12 May, and descending to an altitude of 300 feet (91 meters), dropped three flags, Norwegian, Italian and American, then proceeded south to Alaska. The explorers arrived at Teller at 3:30 a.m., 14 May, and due to adverse weather conditions, ended their flight at that location. Norge had covered 3,393 miles (5,460.5 kilometers). Amundsen’s flight began just two days after that of Richard E. Byrd and Floyd Bennett aboard their Fokker F.VII/3m, Josephine Ford. Byrd’s flight has been the subject of some controversy as to whether they actually had arrived at the North Pole. The flight of Norge is undisputed. 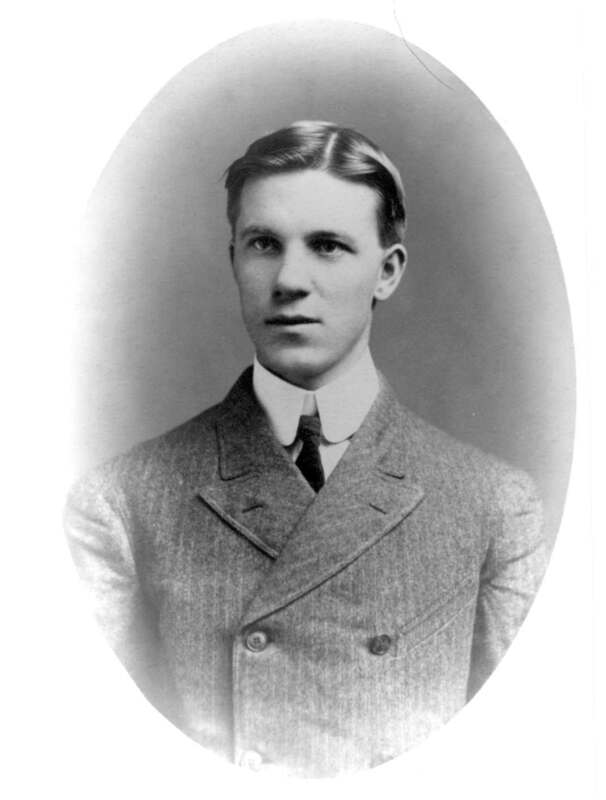 14 May 1908: Charles William Furnas, a mechanic for the Wright Company, was the first passenger to fly aboard an airplane. 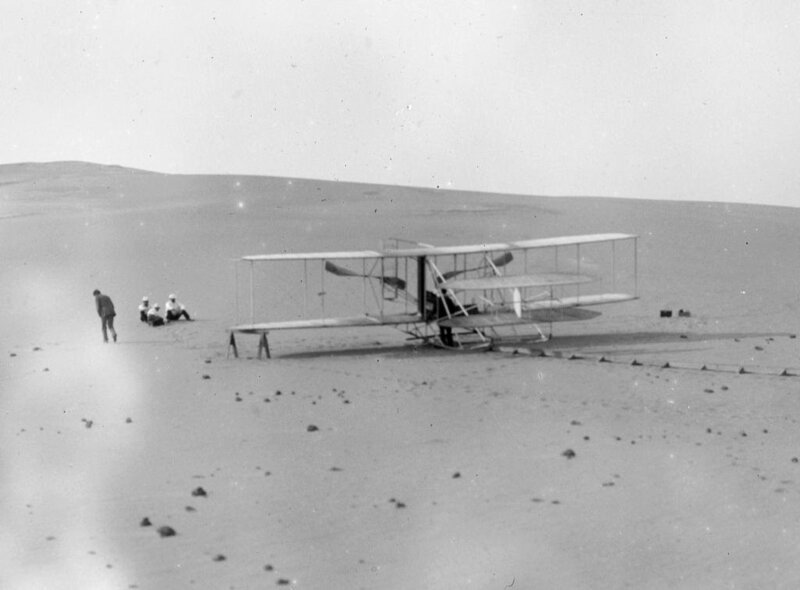 At the Kill Devil Hills, Kitty Hawk, North Carolina, Furnas rode aboard the Wright Flyer III with Wilbur Wright as pilot. The flight covered approximately 600 meters (656 yards) and lasted for 29 seconds. Later the same day, Orville Wright flew the airplane, again with Charley Furnas aboard, this time covering 2.125 miles (3.42 kilometers) in 4 minutes, 2 seconds. Charles William Furnas was born at Butler Township, Montgomery County, Ohio, 20 December 1880. He was the second of three sons of Franklin Reeder Furnas, a farmer, and Elizabeth J. Rutledge Furnas. Furnas enlisted in the United States Navy at Dayton, Ohio, 15 November 1902, and was discharged at New York City, 14 November 1906. Furnas, a machinist, married Miss Lottie Martha Washington, 3 June 1913. Mrs. Furnas died 1 January 1931. On 30 January 1931, Charles Furnas was admitted to a Veterans Administration Facility in Jefferson Township, Montgomery County, Ohio, where he would remain for the rest of his life. Charles Furnas died at the Veterans Administration Hospital, Dayton, Ohio, at 9:00 a.m., 15 October 1941. His remains were interred at the Woodland Cemetery and Arboretum, Dayton.